I call this my "Hungry? No Poblano! 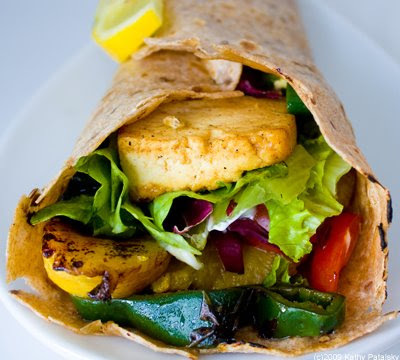 Wrap". 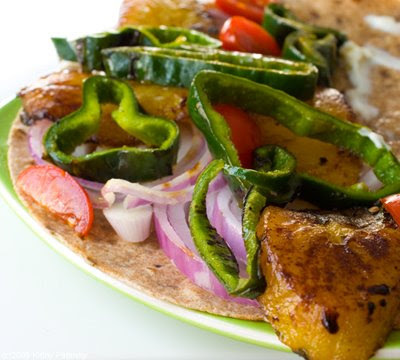 Keep it in your recipe repertoire for a fast, delicious, easy-yet exotic meal. 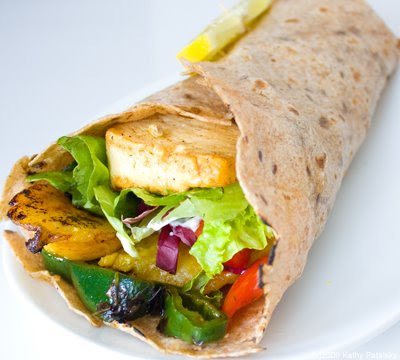 Great protein from the tofu, fiber from the peppers, plantains and tortilla. The spicy kick from the poblano is stimulating to your palate. Step 1) Saute plantain slices in 2 Tbsp olive oil. Set aside, on a glass plate or wax paper. Step 2) Roast the poblano pepper over a gas burner or in the stove-until black bubbly skin forms. How to Roast a Pepper 101 here. Slice pepper into strips. Set aside. Step 3) Saute tofu slices in agave syrup, olive oil, citrus juice, liquid smoke and finish with a bit of salt and pepper. Slice into smaller cubes if desired before assembling wraps. Heat each tortilla on gas burner or in oven until warm and slightly charred. 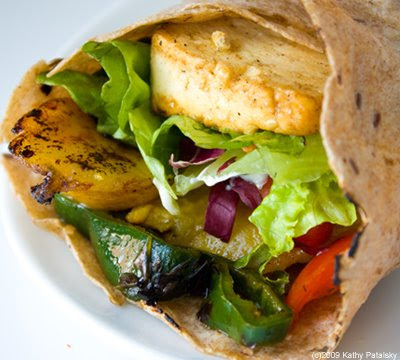 Step 4) Assemble wraps by spreading 1 Tbsp of vegan sour cream (Vegenaise will also work) on the inside of each tortilla. 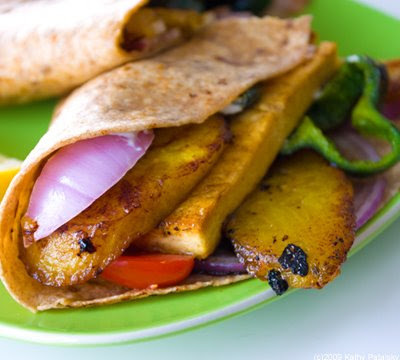 Add 1/3 of the plantain slices to each tortilla. Add the pepper strips and tofu cubes. Add a handful of fresh crunchy greens, red onion slices and tomato slices. 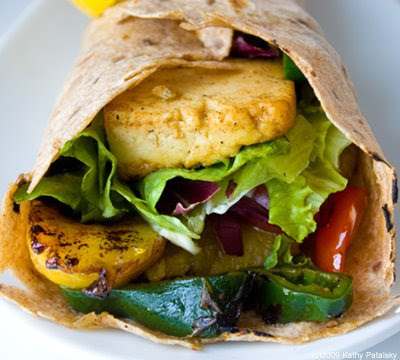 Fold up wrap like a burrito on one end-leave the other end open. Secure bottom end of wrap with toothpicks. stick a citrus slice in the toothpicks as a usable garnish. Plate with salsa, guacamole or a side of mango chutney. *Add some melted vegan Jack cheese over plantains. *Add a splash of apple cider vinegar to the veggies.